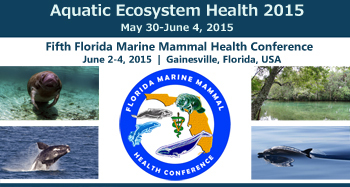 The University of Florida’s Aquatic Animal Health Program is proud to host Aquatic Ecosystem Health 2015, consisting of two back-to-back conferences: the Third International Symposium on Ranaviruses and the Fifth Florida Marine Mammal Health Conference. Florida is the perfect location to host a joint discussion addressing global aquatic ecosystem health issues because its ecosystems, economy, and heritage are inextricably linked to its diverse water resources. The Florida ecosystem faces many of the global challenges affecting aquatic ecosystems worldwide, such as population growth, rising temperatures, ocean acidification, chemical contamination of surface waters, an unprecedented number of unexplained marine mammal mortality events. Furthermore, significant disease epizootics in freshwater habitats, including ranavirus infections in amphibians, have been increasingly documented. 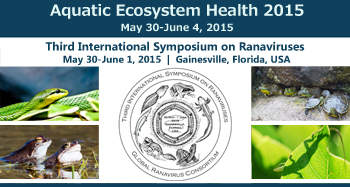 These conferences provide a forum for Marine Mammal and Ranavirus experts to address the complexity of global aquatic ecosystem health in a broad perspective. Please join us for one or both of these conferences and be a part of the discussion. Individuals who attend both receive a discount. Visit the web sites linked below to learn more.